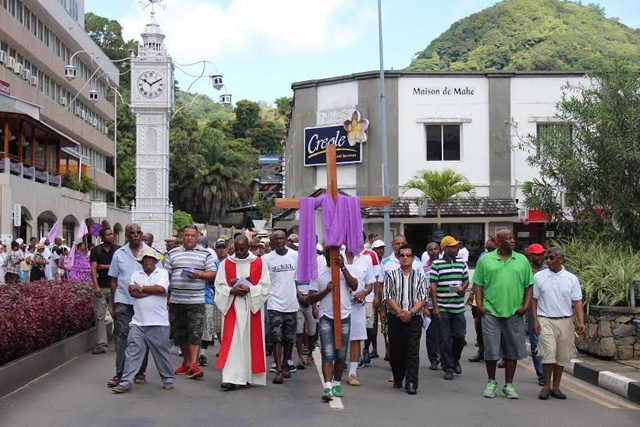 (Seychelles News Agency) - In 32-degree Celcius heat and 66 percent humidity, Christians in the Seychelles archipelago today thronged the streets to re-enact the Stations of the Cross, the procession of torture Jesus is believed to have been forced to undertake before being crucified over two thousand years ago. All across the country of 90,000 people located in the western Indian Ocean, Roman Catholics gathered to observe the annual Easter ritual that takes place on Good Friday to feel what Christ could have endured before being crucified. 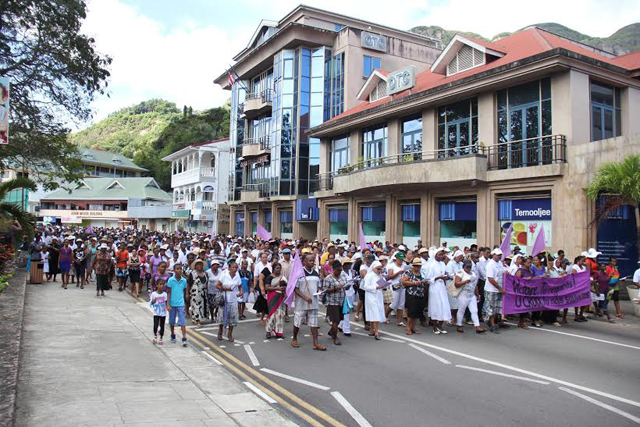 Catholic processions took place today in most of the 25 districts of the Seychelles, scattered across the main populated islands of Mahé, Praslin and La Digue. 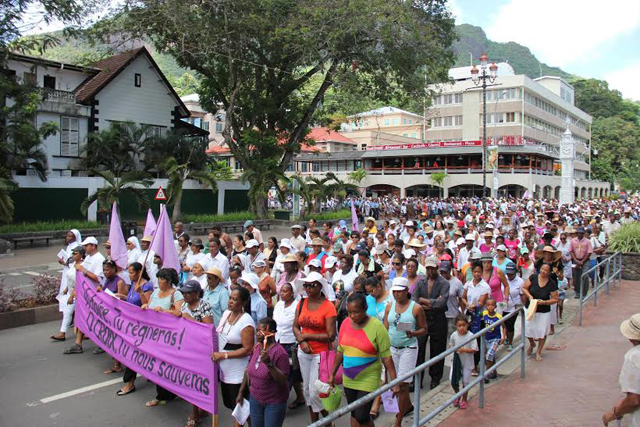 The largest gathering was held in the capital of Seychelles, Victoria, where hundreds of people marched for about two hours through the streets, stopping at different stations to sing hymns and pray. The main feature of the processions is a wooden cross that leads the way, passed on from one person to another along the way. Despite the relentless sun, some participants have partaken in this ritual for many years. The last Station was preceded by a procession of about 400 schoolchildren walking through the Cathedral grounds. 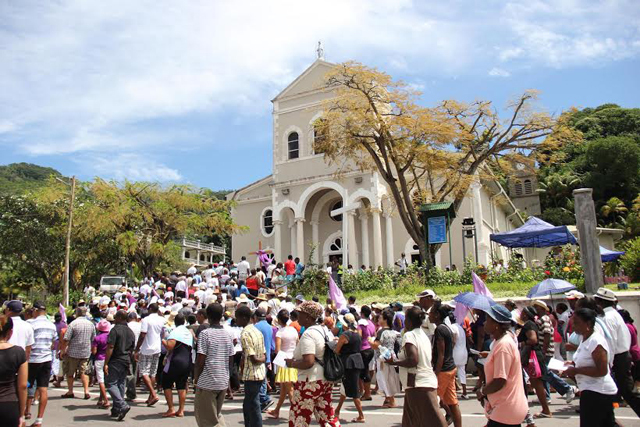 The procession ended with more prayers and hymns upon reaching the Cathedral.In the Seychelles capital of Victoria on the main inhabited island of Mahé, the procession began at the car park of the Victoria commercial port and progressed through the main streets of the capital to reach the imposing Cathedral of the Immaculate Conception about two hours later. Raymonde Accouche, 77, said this was the first time she had taken part in the Stations of the Cross in Victoria, as she usually participates at Plaisance, a parish in the capital's southern suburb. Some adults had come to accompany children preparing for their Holy Communion. This was the case of senior police officer Peter Dacambra, 40, who had accompanied his 9-year-old son, Joshua. He has been taking part in the ceremony every year, though he usually goes to Cascade, his parish, about 8 kilometres from Victoria. “In Cascade, it is much more of a sacrifice, as we have to walk up the hill amid huge granite boulders to complete the 14 stations,” he told SNA. Anna Amade, 40, was also accompanying her 8-year-old daughter Zera. Other faithful prefer to travel in their own parish districts by walking in courses specially created for the occasion. The more adventurous go up into the mountains of Trois Freres overlooking the capital, and enjoy the panoramic view upon arrival at the top. 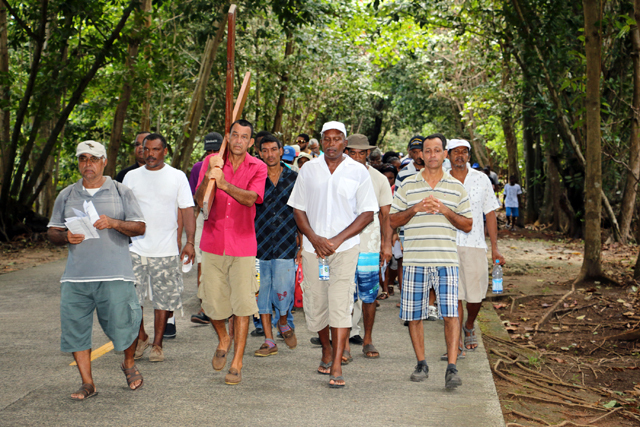 On the second most populated island of Praslin, the Roman Catholic population also commemorated the sacrifice of their saviour. Easter is the most important Catholic feast for the Seychelles, as the majority of its population – around 76 percent – is Catholic. During the public holiday on Good Friday and throughout the Easter weekend, the churches are likely to be filled with the faithful.